Dr. Zhivago is a timeless and classic piece. It details the turbulent history of Russia. The plight of the people and the suffering is brought to light through scenes of fighting, suffering and subjugation. There is a tremendous focus on survival as the life of the characters and of the country moves on. In brief, the story is set against the background of WW I and the Russian Revolution. 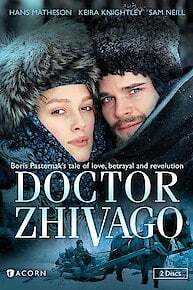 Yuri Zhivago is a young doctor and poet who cannot escape his feelings for Lara, who is married to a political extremist. They find each other only to be apart again. They have countless challenges to their love, yet it prevails. The attraction is beyond physical and beyond good sense. Yury has been captured by the Partisan. Lara nurses Tonya as she has her baby. Yury returns to Moscow to find his house has been taken over by the Reds. He becomes a surgeon at a Moscow hospital but Mischa advises him to leave Moscow. Changed by his war experiences and time with Lara, Zhivago returns home to his wife and family in Moscow to find that conditions there are dramatically altered. Rather than face starvation in the city, the family embarks on a long and arduous journey east to take refuge at an abandoned estate in the Urals. A chance meeting with Lara changes everything for Zhivago. Agonizing over his betrayal to Tonya, he tries to break away from Lara and return to his family, only to be sucked into the bloody struggle between the Whites and the Reds. Growing up in Moscow with his uncle, aunt and cousin Tonya, Yury is captivated by a stunning young girl called Lara. A life of purpose and contented bourgeois respectability lies before young physician Yury Zhivago as he marries Tonya, his dearest friend. But a glimpse of an ethereally beautiful girl--and the power of the popular uprising boiling over in the streets of Moscow--take his life on a very different course. Betrayed by her mother, and by her own awakened sensuality, Lara loathes what she is becoming in the grip of the manipulative Komarovsky. Marriage to Pasha, the earnest partisan who has always adored her, promises to be her salvation.